Virtual Vault Pro - Hide Your Personal Files! Just By Dragging Them Into Your Own "VIRTUAL VAULT"! PLUS: SHRED the Original Files From Your Disk, Permanently! EVERYONE has a few PRIVATE FILES on their PC. Financial spreadsheets. Job application letters. Your personal diary. Secret e-mail conversations. Adult images. The kind of files that you DON’T want others to see. Like your kids, your spouse, your colleagues – even nosey PC repair technicians. It allows you to create a “virtual vault” on your PC. Just drag-and-drop your private files into the vault – and it’ll protect them for you. It’ll also thoroughly shred the original file from your hard disk, so it leaves absolutely NO TRACE. Not even the FBI could recover the original! To access your virtual vault in future, just double-click on the vault, then enter your password. It’s SIMPLE, it’s POWERFUL – And it WORKS. Discover How EASY It Is To PROTECT Your PRIVACY! Want to see just how EASY it is to get started with Photo Vault Pro? Just click below to watch the official Photo Vault Pro demonstration. It’s SIMPLE! Here’s How to DRAG and DROP Your Way to PRIVACY! Discover These Awesome VIRTUAL VAULT PRO Features! Virtual Vault Pro provides you with guaranteed privacy – at the click of a mouse. It’s so powerful, it’s encryption system CANNOT be broken - not even by the world's LEADING data forensic specialists. And that includes those employed by the FBI! And YOU can get started with this great program within the next few minutes! using the MOST ADVANCED encryption algorithms available. the FBI will be able to recover your original files and images! images. It’s SECURE and leaves no trace on your PC! of ANY size (2GB maximum vault size) - and you’re instantly protected. Virtual Vault Pro doesn’t stop there. It also includes a separate multi-level file shredder, printing support, system tray and floating vault modes, comprehensive help, startup preferences, and more! So what are you waiting for? Get ready to download YOUR copy, TODAY! GUARANTEE Your Privacy From TODAY - For $19.95! PLUS: FREE Lifetime Upgrades & $200 in FREE Software! Virtual Vault Pro is the only way to GUARANTEE your private files are kept PRIVATE. As part of our special January promotion, you can NOW grab your copy of Virtual Vault Pro for JUST $19.95. That includes INSTANT download links, FREE lifetime upgrades, and FREE lifetime support. PLUS: Order before midnight, Monday, January 28th 2019, and we’ll also throw in a bonus parcel of FIVE fantastic software tools, guaranteed to boost your online privacy! They’re guaranteed to be worth an EXTRA $200. And they’re all yours – FREE! 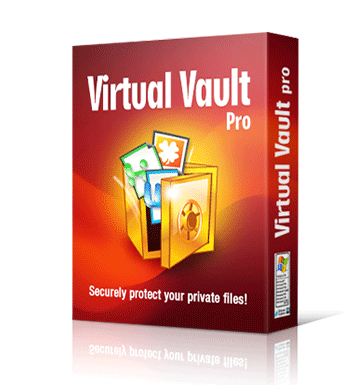 So, grab your copy of Virtual Vault Pro TODAY for JUST $19.95 – and begin protecting YOUR privacy! Price converted to your local currency. Around £12.95 or 14.95 Euros. Download links sent instantly. Windows-only. Still unsure? Watch our mini-movie, read our Frequently Asked Questions, or download the DEMO version. Home - FAQ - Affiliates - Contact Us - BUY NOW! Want to earn extra cash? Earn 50% on every single sale. We pay you after just 35 days. Best affiliate program on the Net.